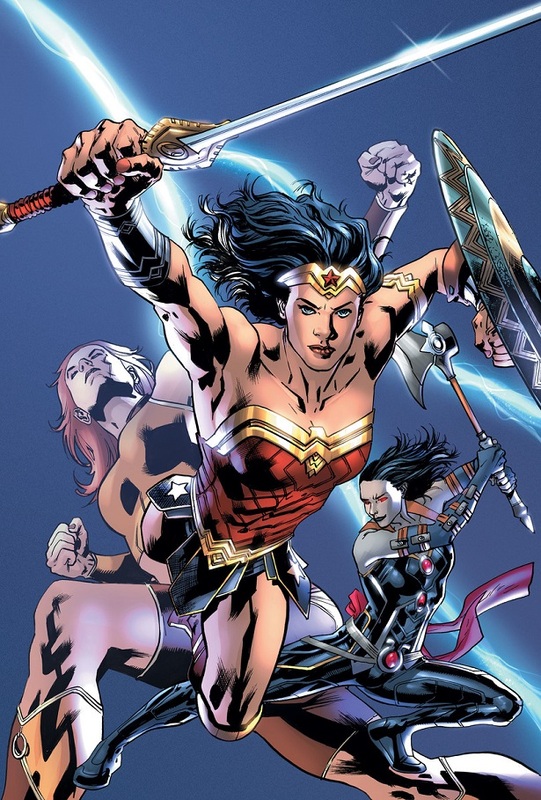 With Wonder Woman's regular monthly comic series losing the creative team of Greg Rucka, Nicola Scott, and Liam Sharp after one year, the series is still looking for a regular creative team. Writer Shea Fontana, is taking over for a small story arc soon, and then in September, DC Comics has announced that this fall—with Wonder Woman #31—a new creative team comprised of writer James Robinson (Starman, Earth-2), Carlo Pagulayan (Deathstroke), and Emanuela Lupacchino (Supergirl) and will begin a six-month run on DC’s main Wonder Woman twice-monthly comic book series with a new story arc, "Children of the Gods." And it is said to focus on Diana's mysterious...lost brother? "Taken away from Themyscira in the dead of night, the mysterious Jason (the only male ever born on the island) has been hidden somewhere far from the sight of gods and men…but his life and Wonder Woman's are about to intersect in a terrifying way, bringing them face-to-face with a cosmic threat they never imagined!" While this story may indeed be interesting (I don't want to condemn anything too much without having read a page of it), the idea of Wonder Woman having a long lost male sibling feels like yet another example of DC trying to force more men into Diana's family and origin story. This has been going on since the DC Universe relaunched in 2011 with the New 52 when Brian Azzarello began writing Wonder Woman. In the original William Moulton Marston concept, Diana was formed from clay and given life by the Goddesses. This origin was tweaked somewhat over the years—mostly by George Perez—but the basics more or less remained the same. Then, with the advent of the New 52, it's discovered that Diana's clay origin was a lie, one created by Queen Hippolyta to cover up the fact that her daughter is the result of an affair with Zeus—an affair that must be covered up so Zeus' wife Hera doesn't kill the child in a jealous rage. We were then introduced to several half siblings of Wonder Woman's (almost all men) while her fellow Amazons were turned into snakes. Azzarello wanted more dudes in the story, because heaven knows there aren't about a million other male superheroes who are all about the dudes and their patriarchal influences. Geoff Johns' Darkseid War arc brought in another Amazon/God Hybrid with Grail, the daughter of an Amazon and the God of Evil, Darkseid. Then Rebirth happened, and it seemed Greg Rucka retconned the New 52/Azzarello run on Wonder Woman, including her being the result of an affair between Hippolyta and Zeus. The Azzarello Amazons (who were, frankly, awful man-hating murderers) were explained away as a delusion to keep Diana from trying to find the real Themyscira. But if all of that was a delusion, then how does she have a twin brother? And how is Grail even a thing, if those Amazons were merely a delusion? While Rebirth has tightened up a lot of DC Continuity, at the moment, Wonder Woman's is still something of a hot mess. Here's the thing though: Wonder Woman doesn't need a bunch of male relatives to appeal to men. The Patty Jenkins-directed Wonder Woman movie didn't include any "Manazons," and although Zeus is still her father in the film, the way she was brought into the world remained vague. (Meaning: the focus was definitely not her father or half-brother Ares.) And yet, the film still managed to be a massive success, with women AND men flocking to see it again and again. The idea of needing to inject more men into her mythology feels like a desperate attempt to appeal to male sexism, and a perceived inability to connect to stories where women are front and center. Hopefully when this is all said and done, Wonder Woman will once again not have a single male relative, and be the product of female Gods and and a powerful matriarchy. Sure, men need to be a part of her story, but part of the magic of Wonder Woman is that everything that made her who she is came without a Y chromosome. In the meantime, here's hoping James Robinson can spin a compelling yarn and make all of this extra masculinity injected into Diana's mythos worth it for readers. What do you think of the former only child of Themyscira having a male sibling? Let us know down below in the comments.